BURBANK, Calif.--(BUSINESS WIRE)--From director George Miller, originator of the post-apocalyptic genre and mastermind behind the legendary “Mad Max” franchise, comes “Mad Max: Fury Road,” a return to the world of the Road Warrior, Max Rockatansky. The behind-the-scenes creative team includes Oscar-winning director of photography John Seale (“The English Patient”), production designer Colin Gibson (“Babe”), editor Margaret Sixel (“Happy Feet”), Oscar-winning costume designer Jenny Beavan (“A Room with a View”), second unit director/supervising stunt coordinator Guy Norris (“Australia”), and makeup designer Lesley Vanderwalt (“Knowing”). The film has been rated R by the MPAA for intense sequences of violence throughout, and for disturbing images. Dark Horse Comics Announces "The Complete Love Hurts"
With a foreword by Peter Snejbjerg (B.P.R.D., Starman, Preacher), The Complete Love Hurts hits stores October 28, 2015 at a bargain price of $19.99, and will collect over 200 pages of Andersson’s horror-romance comics with material from Dark Horse Presents, Swedish alternative comics anthology From the Shadow of the Northern Lights, and many more. From Vulture: Trevor Noah is the new host of "The Daily Show." From YahooTV: First footage from "The Walking Dead" spinoff, "Fear the Walking Dead." From THR: The winner of the 3/27 to 3/29/2015 weekend box office is DreamWorks Animation's Home, with an estimated take of $54 million. From ScreenRant: CBS looking at new "Star Trek" television series. Horay! From EOnline: Sacha Baron Cohen "Freddie Mercury" project back on. From Variety: Trevor Noah joins shortlist to replace John Stewart on "The Daily Show." From YahooMovies: First "Spectre" trailer - the new James Bond movie. From YahooMovies: According to his Instagram page, Hugh Jackman will only play Wolverine one more time. From YahooMovies: Simon Pegg says "Star Trek 3" will reflect the spirit of the original "Star Trek." From Variety: Idris Elba in talks to be the villain in "Star Trek 3." From IGN: An article about the "All-New, All-Different Avengers," but the comments section is the better read. From IBTimes: Deadpool movie plot details and relation to Wolverine movies. From BleedingCool: Don't call it a reboot - post Secret Wars. From LakersNation: Rookie Julius Randle never lost confidence during the recovery from his injury... in part because of Kobe. STAMFORD, Conn.--(BUSINESS WIRE)--In addition to the premium monthly live pay-per-view events, WWE Network unveiled new programming for the remainder of 2015, which includes eight brand new original series and partnerships with director Jeff Tremaine, Seth Green’s Stoopid Buddy Stoodios and legendary talk show host Jerry Springer. WWE, in partnership with Seth Green’s Stoopid Buddy Stoodios, will debut a new, animated short-form comedy series entitled Camp WWE. Imagine WWE Superstars and Divas when they were kids at their favorite summer camp…which happens to be run by none other than Mr. McMahon – add in shock-value, slapstick humor and social satire – and you have WWE’s first adult comedy, which will debut later this year. WWE teams up with the Director of Jackass and Bad Grandpa, Jeff Tremaine, to give you the hilarious original series, Swerved. Swerved is a half hour series and will premiere in May. WWE spans the globe in search of the most beautiful, athletic and charismatic women to find the next stunning WWE Diva. This competition will give viewers the opportunity to witness the challenges, trials, drama and rewards that accompany the journey of these women, as they vie for superstardom. Coming this Fall. "I suspect 25 years of The Jerry Springer Show qualifies me to comment on outrageous behavior,” said Springer. “And what is more outrageous than the entertainment, drama and craziness of the WWE. This is going to be fun." Podcast host Chris Jericho challenges his guests in provocative, candid conversations about their careers, their lives, past controversies and the overall state of WWE. The monthly series kicks off Monday, April 6 immediately following Raw, with its first one-hour episode featuring WWE Superstar John Cena. “I’m stoked to bring my show to WWE Network and give Jerichoholics worldwide more of what they've come to expect - humor, questions that have never been asked before and the best conversations that any podcast host has ever delivered,” said Jericho. “No matter who the guest is, whether it be WWE Superstars, Divas, Legends, executives or icons from the entertainment world, I guarantee to deliver the best, most entertaining interview you have ever heard from each and every one of them." In addition to the eight new original series, WWE Network will also debut new episodes of the highly-acclaimed docu-series WWE 24 as well as WWE Countdown and Rivalries. WWE will also add more children’s programming by bringing back the popular 1980s animated series, Hulk Hogan’s Rock ‘N’ Wrestling. In addition, WWE Network will produce compelling specials and short form content, while continuing to add 1,000 hours to its robust video-on-demand library, which currently has more than 3,000 hours of content. Harkening back to 1985, this Saturday morning cartoon, which originally aired on CBS, features Hulk Hogan, Andre the Giant, Junkyard Dog, Captain Lou Albano, and Roddy Piper in a series that is both nostalgic and entertaining, 30 years later. WWE Network will look back at this epic David vs. Goliath encounter at WrestleMania 24 (2008) and its shocking conclusion coming just in time for Mayweather vs. Pacquiao, which is expected to be one of the biggest boxing matches in history. WWE Network, which launched on February 24, 2014, surpassed 1 million subscribers in just 11 months making it the fastest-growing digital subscription service, and is now available in more than 175 countries. Like other digital subscription services, such as Netflix and Hulu Plus, fans are able to sign up for WWE Network online by going to WWE.com and can watch WWE Network on their TVs through connected devices such as Sony PlayStation 3, Sony PlayStation 4, Xbox One, Xbox 360, Amazon Fire TV, Apple TV and Roku streaming devices as well as Smart TVs including Sony and Samsung. WWE Network’s one-of-a-kind programming includes all 12 WWE pay-per-view events LIVE at no additional charge plus groundbreaking original series, reality shows, documentaries, classic matches, exclusive coverage of special events and more than 3,000 hours of video-on-demand programming. WWE, a publicly traded company (NYSE:WWE), is an integrated media organization and recognized leader in global entertainment. The company consists of a portfolio of businesses that create and deliver original content 52 weeks a year to a global audience. WWE is committed to family friendly entertainment on its television programming, pay-per-view, digital media and publishing platforms. WWE programming reaches more than 650 million homes worldwide in 35 languages. WWE Network, the first-ever 24/7 over-the-top premium network that includes all 12 live pay-per-views, scheduled programming and a massive video-on-demand library, is currently available in more than 175 countries. The company is headquartered in Stamford, Conn., with offices in New York, Los Angeles, London, Mexico City, Mumbai, Shanghai, Singapore, Dubai, Munich and Tokyo. DENVER--(BUSINESS WIRE)--Fathom Events, in partnership with National Theatre Live and BY Experience, are pleased to present “NT Live: Hamlet” on October 15, 2015 at 7:00 p.m. local time. Academy Award® nominee Benedict Cumberbatch (The Imitation Game) takes on the title role of William Shakespeare’s great tragedy directed by Lyndsey Turner and produced by Sonia Friedman Productions. Captured live earlier the same day, the event will be broadcast from London’s Barbican Theatre to select U.S. cinemas. Tickets for “NT Live: Hamlet” can be purchased online by visiting www.FathomEvents.com or at participating theater box offices. Fans throughout the U.S. will be able to enjoy the event in select movie theaters through Fathom’s Digital Broadcast Network. For a complete list of theater locations visit the Fathom Events website (theaters and participants are subject to change). For artwork/photos related to “NT Live: Hamlet,” visit the Fathom Events press site. Sonia Friedman Productions, founded in 2002, is a West End and Broadway production company responsible for some of the most successful theatre productions in London and on Broadway over the past few years. SFP has developed, initiated and produced over 140 new productions and has won numerous Olivier and Tony Awards, including a record-breaking 14 at the 2014 Olivier Awards (Best New Musical, Best New Play, Best Revival of a Musical and Best Revival of a Play, among others). Their recent West End and Broadway theatre productions and co-productions include: the UK premiere of The Book of Mormon, Jez Butterworth's The River on Broadway, starring Hugh Jackman, Sunny Afternoon, Shakespeare in Love, The Nether, Electra, King Charles III, Jerusalem, Ghosts, Mojo, Chimerica, Twelfth Night & Richard III and Old Times. In addition to SFP’s theatre projects Sonia is also Executive Producer, alongside Playground Entertainment, on the up-coming television adaptation of Ronald Harwood’s The Dresser starring Anthony Hopkins and Ian McKellen, to be directed by Richard Eyre for the BBC. She is also a co-producer on the six-part mini-series adaptation of Hilary Mantel’s Wolf Hall for the BBC and Masterpiece co-produced with Playground Entertainment and Company Pictures. Now celebrating its 6th year broadcasting live performances to cinema screens internationally, National Theatre Live has now been experienced by over 4 million people worldwide. The first season began in June 2009 with the acclaimed production of Phédre starring Helen Mirren. In addition to the record-breaking broadcast of The Audience starring Helen Mirren as The Queen (winner of two 2013 Olivier Awards, including the Best Actress award for Mirren), recent broadcasts have included the Manchester International Festival production of Macbeth with Kenneth Branagh in the title role, Nicholas Hytner’s acclaimed production of Othello with Adrian Lester and Rory Kinnear, the Donmar Warehouse production of Coriolanus with Tom Hiddleston, in the title role, the Young Vic’s production of A Streetcar Named Desire with Gillian Anderson and Skylight from the West End with Bill Nighy and Carey Mulligan. For more information, visit www.NTLive.com. BY Experience kicked off the digital revolution of live events to movie theaters and other locations globally with David Bowie’s 2003 Reality album launch and since then, over 22 million tickets have been sold worldwide for cinema events BY Experience has distributed globally. Current cinema series credits: Distribution Representative, The Met: Live in HD (Worldwide; since 2006), the U.K.’s National Theatre Live (Ex-UK; since 2009), Bolshoi Ballet (North America; since 2014), Stratford Festival HD (Ex-Canada, since 2014). Additionally, BY Experience has executive produced and/or distributed several diverse programs for cinema including numerous rock concerts, radio programs, fine art exhibits, and other special content events. BY Experience distributes to over 60 countries, to over 2,000 movie screens. www.byexperience.net. 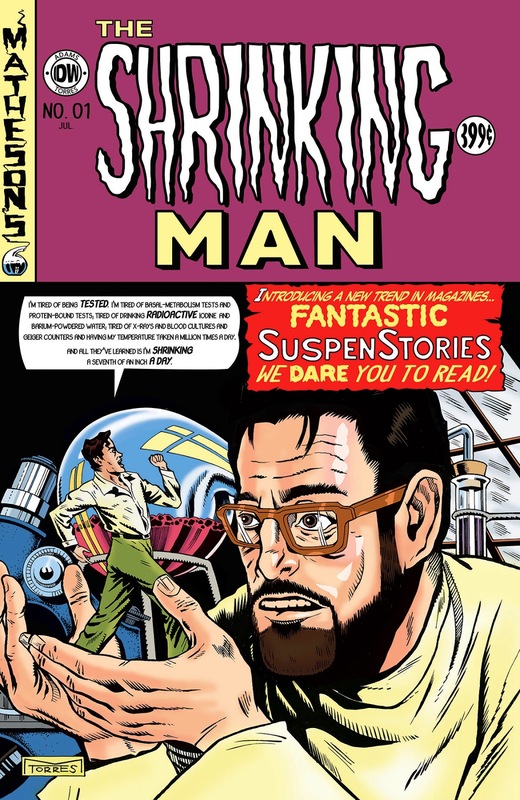 IDW Publishing Announces Comics Adaptation of "The Shrinking Man"
IDW Publishing is proud to announce the comic-book adaption of the late Richard Matheson’s seminal science fiction novel, The Shrinking Man. Ted Adams, IDW’s CEO & Publisher, is adapting the material, alongside artist Mark Torres. Matheson’s exploration of withering manhood and social norms is brought to vivid life in this 4-issue series. To further emphasize the series’ classic appeal, the debut issue will be a part of IDW’s month-long “EC Comics cover month” promotion. The Shrinking Man #1 will be one of a dozen IDW titles getting a variant cover that pays tribute to the classic EC Comics cover designs from the 1950s. The Shrinking Man #1’s homage to Al Feldstein’s brilliant Weird Science #12 from the June 1950 cover is also being drawn by series artist Mark Torres. Originally published in 1956, The Shrinking Man has been adapted into a motion picture and won the 1958 Hugo award for best science fiction/fantasy dramatic presentation. This legendary tale chronicles the events of an average family man, Scott Carey, who, after being exposed to a mysterious cloud, comes to the frightening realization that he is shrinking slowly day-by-day. His everyday existence as a husband and father is thrown into chaos as he struggles with not just shrinking smaller and smaller but with the possibility that he may disappear all together. All ideas of normal fade as Carey becomes a national spectacle and his family converts into unreachable giants. He is pushed to the very limits of fear and existence with each passing day becoming a struggle just to survive. The Shrinking Man, part of IDW’s Five Featured Firsts, which sees a new series launching each of the five Wednesdays in July, takes its place alongside other IDW/Matheson collaborations including I Am Legend, Hell House, numerous short stories including the Eisner-nominated “Blood Son,” and Duel. Grab your copy before the stacks wither away at your local comics shop. Greg Weisman (Gargoyles, Star Wars Rebels, Young Justice, Star Wars Kanan: The Last Padawan) announces the AudioPlay adaption of his novel, Rain of the Ghosts. This full cast production features sound effects, music and an award-winning cast including Emmy winners, Ed Asner (Up, Mary Tyler Moore Show, Lou Grant), and Bryton James (The Young & The Restless, Young Justice), Star Trek: The Next Generation’s Marina Sirtis and Brent Spiner, Sons of Anarchy’s Jacob Vargas and an all-star lineup of animation voice talent from Star Wars Rebels, Young Justice, Spectacular Spider-Man, Gargoyles and Darkwing Duck. 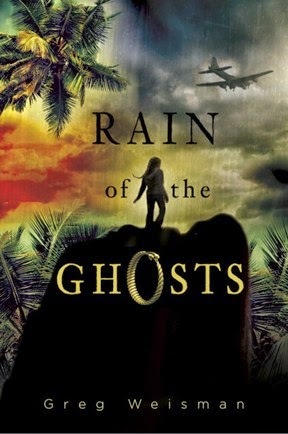 Rain of the Ghosts is a Young Adult Paranormal adventure about Rain Cacique, a 13-year old girl living on the Ghost Keys, a chain of islands on the edge of the Bermuda Triangle. In this first book of the series, Rain discovers she has the ability to speak with ghosts and that a family heirloom holds the key to an ancient secret that mysterious forces want to stop her from learning. Rewards include pre-orders of the AudioPlay, dinner with Greg & cast members, as well as an Associate Producer credit on the final product. In 1998, Greg became a full-time Freelancer. He wrote the new Gargoyles and Gargoyles: Bad Guys comic books for SLG Publishing, while producing, writing, story editing and voice acting for Sony’s The Spectacular Spider-Man. He then moved over to Warner Bros., where he produced, story edited, wrote and voice acted on the new series,Young Justice, as well as writing the companion Young Justice monthly comic book for DC. Greg was a writer and Executive Producer on the first season of Star Wars Rebels for Lucasfilm and Disney, and he’s also writing the spin-off comic Star Wars Kanan: The Last Padawan. His first novel, Rain of the Ghosts, was published in 2013; its sequel, Spirits of Ash and Foam, arrived in bookstores in 2014. On January 1st of 2015 – Entrepreneurs Sergio Pedroza and Sean Patrick O’Reilly joined forces to bring some of Arcana’s most memorable titles to ClickOnComics. ClickOnComics is the first subscription-based web application that allows comic book readers the ability to stream a variety of digital comics from publishers all around the world. And for just $4.99 a month, ClickOnComics members can Unleash hundreds of titles, and experience comics like never before! “We set out to create something different, something that could change the comic book industry forever,” said ClickOnComics CEO Sergio Pedroza. ClickOnComics is now available on any Browser using any Mobile Device, in the App Store, and will be launching their first Android application later this year. And with hundreds of titles being added every month, ClickOnComics has set out on a mission to become the first social comic book platform where all of our favorite superheroes can finally unite. FLOWER MOUND, Texas, PRNewswire/ -- FUNimation Entertainment announced its distribution of the theatrical, home entertainment, video on demand and broadcast rights to the upcoming Japanese animated feature film Dragon Ball Z: Resurrection 'F'. Dragon Ball will be released by Toei in association with Fox International Productions in Japan on April 18, 2015. Dragon Ball Z: Resurrection 'F' represents the nineteenth feature film in the Dragon Ball series, Resurrection 'F' is the sequel to Dragon Ball Z: Battle of Gods which was released by Fox and Toei in Japan in 2014 and grossed more than $30M in Japan. The English dub of the new film will be released in theaters across North America in summer 2015. Series creator Akira Toriyama is directly involved in the film's production, just as he was in the highly successful Dragon Ball Z: Battle of Gods. Some fans of the franchise won't have to wait until the summer to see the film, though. FUNimation Entertainment and Toei have teamed up with Fox International Productions & Toei Animation to host the world premiere of Dragon Ball Z: Resurrection 'F' (in Japanese w/ English subtitles) at the Egyptian Theatre in Los Angeles, CA on Saturday, April 11. This premiere will be also held to promote the April 18 release of the movie in Japan. "We are honored to host the world premiere of Dragon Ball Z: Resurrection 'F' here in the United States," said Gen Fukunaga, CEO and President of FUNimation Entertainment. "Based on last year's fan response to Battle of Gods, I have no doubt that audiences will enjoy this eagerly anticipated sequel." Fans in the Los Angeles area can be among the first in the world to see Dragon Ball Z: Resurrection 'F'. 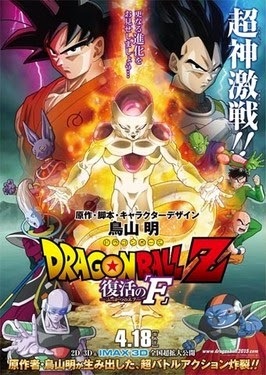 A limited amount of tickets to the premiere were made available to fans and the general public on March 15, 2015 at www.dragonballz.com. Dragon Ball is one of the most beloved anime franchises of all time, and this acquisition represents the ongoing partnership between FUNimation Entertainment and Toei Animation. Together they have delivered the Dragon Ball brand to fans in North America for over 20 years. For more information on Dragon Ball Z: Resurrection 'F', and to purchase tickets to the world premiere, please visit www.dragonballz.com. Tickets are extremely limited. Like us on Facebook at www.facebook.com/dragonballz & www.facebook.com/funimation, and follow us on Twitter at www.twitter.com/funimation. Toei Company Ltd., since its foundation in 1951, has been supported by a broad range of fans for over half a century. The company focuses on providing high quality, comprehensive entertainment through the production of theatrical movies, TV dramas, direct-to-video productions, and anime, as well as a diverse range of businesses based on film production. With headquarters in Tokyo and sales offices in Paris, Los Angeles, Hong Kong and representative office in Shanghai and Taipei, Toei Animation (Jasdaq: 4816) ranks amongst the world's most prolific animation production studios. Toei Animation's operations include animation development and production, and worldwide marketing and program licensing. Since its founding in 1956, Toei Animation has produced more than 10,000 episodes of TV series (more than 200 titles) and more than 200 long feature films. One of the world's largest producers and distributors of motion pictures, 20th Century Fox Film produces, acquires and distributes motion pictures throughout the world. These motion pictures are produced or acquired by the following units of 20th Century Fox Film: Twentieth Century Fox, Fox 2000 Pictures, Fox Searchlight Pictures, Fox International Productions, Twentieth Century Fox Animation and Blue Sky Studios. From Gawker: The NYPD plan to turn making someone into a felony easy-peasy. From TechDirt: There is no such thing as "contempt of cop." From RSN: In this case, it's a white woman in prison for decades for a murder she did not commit. From RSN: Two inmates shot and one is killed... their hands were handcuffed behind their backs. From ShreveportTime and RSN: Former prosecutor's words are hollow. From GuardianUK: Cleveland PD still killing black teens. From BuzzFlash: Chicago PD uses stop-and-frisk against people of color at 4 times the rate of the NYPD. From RollingStone: Matt Taibbi on the decision to keep Eric Garner grand jury minutes secret. I say if you have nothing to hide, what are you hiding. From YahooNews: San Fran pigs show their Klan-side in text messages. From YahooNews: Missouri Lt. Gov. Peter Kindel probably called his mother "Aunt Mama" and probably thinks the Ku Klux Klan is super-tubular-cool! From Truthout: A history of killing black men and getting away with it. From CapitalNewYork: The NYPD kills and abuses, and then changes the Wikipedia entries about those incidents. From the NewYorker: Release Eric Garner grand jury records... NOW! From GuardianUK: Two cops shot during recent Ferguson protests. From GuardianUK: Long overdue - Ferguson police chief Thomas Jackson resigns, but gets a a year's severance pay, $95,000. The city manager left and got $120,000. From Politico: Yes, Obama's friend the professor found this out. From RSN and Slate: States take over Ferguson court system to restore order and to implement reforms. From teleSUR: White cop kills unarmed NAKED black man. From YahooNews: More on how Madison police chief is doing it differently from Ferguson Klan chief... err... I mean police chief. From Truthout: Why Black America, even the uncle toms, sometimes fear calling the police. From TheGuardian: Madison police chief has a better control of things than that portly clown in Ferguson had. From YahooNews: Black, unarmed, shot dead by cop in Madison, Wisconsin. From CBCNews: A police officer in Quebec drives 75 miles in a 30 mile zone and kills a five-year-old child. Canadian media won't name him, nor has he been charged. From AlJazeeraAmerica: Shot in the back. From The Post via RSN: They're called "SCOPs" and you should know about them. From TheWashingtonPost: Attorney General Eric Holder is prepared to dismantle Ferguson police force if necessary. From HuffPost: This tale of a drunk white man at White Castle begins the Ferguson PD highlights from the Department of Justice's report. From YahooNews: Highlights or low lights from the DOJ's Ferguson Police Department report. From TheVox: A selection of 7 racist jokes from Ferguson police and court officials. They're F'ed up. From TheVox: Justice Department's report on Ferguson PD is due this week. Preview from the New York Times, includes racist jokes (including a horrid one about President Obama), and targeting black to raise funds for the city. From TheGuardian: The Chicago PD have their own CIA-like "black site." From TheGuardian: After Trayvon, a new Civil Rights movement. From Cleveland.com: City responds to lawsuit by Tamir Rice's family. From Reuters via RSN: Justice Department reportedly to sue Ferguson Police Department. 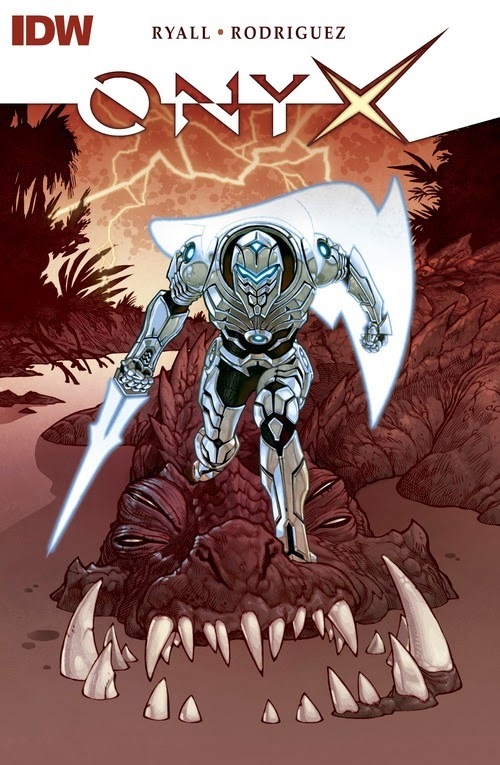 IDW Publishing Announces New Science Fiction Comic Book, "Onxy"
Chris Ryall and Gabriel Rodriguez, the award-winning creators of series such as Locke & Key and Zombies vs. Robots are releasing their first co-creation, Onyx, this summer. Onyx tells the tale of a female metal-suited warrior who comes to Earth on a quest to either save the planet or destroy it. It’s up to a team of super-soldiers to figure out which before it’s too late, and before a much greater threat overwhelms both them and the planet itself. Gabriel and I are excited to release Onyx into the wild, and even more excited to give readers and retailers alike this advance look at the character in Onyx #0,” said “That allows for a nice, risk-free way for people to take a look at her during the ordering period for Onyx #1. And it puts even more phenomenal Gabriel Rodriguez artwork out into the world, which is always a good thing. – Chris Ryall, Onyx Writer and Co-Creator, IDW’s Chief Creative Officer. Ryall and Rodriguez have previously partnered on multiple comic series: Clive Barker’s The Great and Secret Show, George A. Romero’s Land of the Dead, and Beowulf, but this is the first time they’ve created an all-new title together. 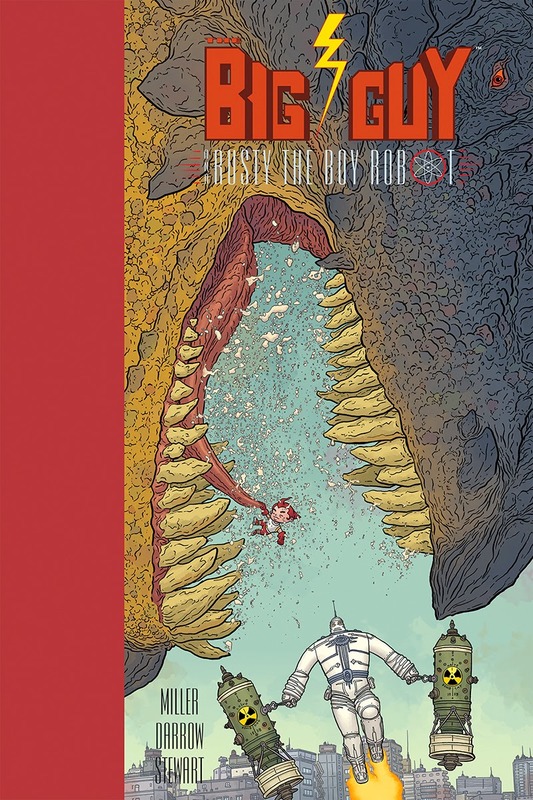 For Rodriguez, Onyx follows his work on the acclaimed, Eisner-winning series Locke & Key with writer Joe Hill, and the just-concluded Little Nemo: Return to Slumberland with writer Eric Shanower. Chris Ryall and Gabriel Rodriguez's Onyx. Onyx #1, one of IDW’s Five Featured Firsts in July which welcomes a new #1 issue each week of the month. BALTIMORE, MARYLAND - Come to Baltimore's Inner Harbor for the 16th annual Baltimore Comic-Con on September 25-27, 2015 at the Baltimore Convention Center. We are excited to welcome to our show returning guests Amanda Conner, Darwyn Cooke, Jimmy Palmiotti, and Frank Tieri. Working in the comics industry since the late 1980s, Amanda Conner got her start working for major publishers like Marvel Comics on Solo Avengers and Excalibur, and Archie Comics on Archie and The Adventures of Bayou Billy. As her career progressed, she worked for a number of noteworthy titles at smaller comics companies, including Soulsearchers and Company for Claypool and Vengeance of Vampirella at Harris. She has since had an extensive illustration career, both in and out of comics, and her latest industry work can be seen on DC Comics' Convergence and Convergence: Action Comics covers, and on Harley Quinn, where she is providing both art and writing (with her husband, Jimmy Palmiotti). Last with us in 2008, Darwyn Cooke made his mark in the comics industry after working in animation such notable series as Batman: The Animated Series, Superman: The Animated Series, and Batman Beyond. His initial success at DC Comics on the graphic novel Batman: Ego parlayed into further work on Marvel's X-Force, Wolverine/Doop, and Spider-Man's Tangled Web. He later went on to work on such noteworthy titles as DC's Just Imagine..., Detective Comics, DC: The New Frontier, and Solo. 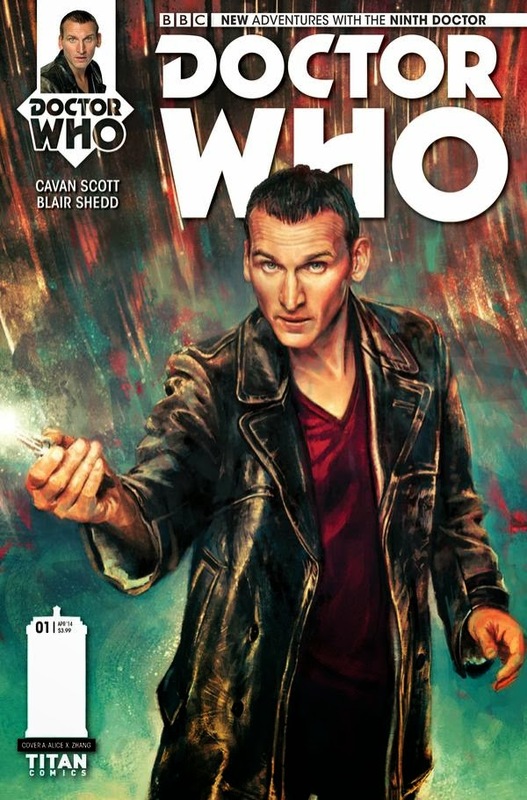 More recently, Cooke has been the cartoonist behind IDW's Richard Stark's Parker series of graphic novels as well as work on a number of DC's Before Watchmen series and variant covers for Action Comics, Convergence, and Harley Quinn. Writer Frank Tieri has established a strong voice in the comics industry, working for many publishers and injecting his unique style along with amusing references to popular culture. He has contributed to a broad range of titles across many publishers, including Marvel's Iron Man, Captain America, Amazing Spider-Man, and Punisher: Noir, DC's Batman, Detective Comics, Hawkman, and Grifter, Dynamite Entertainment's Red Sonja: The Black Tower, and Top Cow's The Darkness. His latest work can be found in DC Comics' Convergence: Suicide Squad, Convergence: Justice League, and Arkham Manor: Endgame, and Marvel's AXIS: Revolutions. "It's been too long since we've seen Darwyn, and we missed Amanda and Jimmy last year," said Marc Nathan, promoter of the Baltimore Comic-Con. "Along with Frank, this is another fantastic group of talented creators that our fans clamor for, and we're so pleased they're returning!" This year's confirmed guests for the show include: Jeremy Bastian (Cursed Pirate Girl); Christy Blanch (The Damnation of Charlie Wormwood); Mark Buckingham (Fables); Cliff Chiang (Wonder Woman); Frank Cho (Jungle Girl); Steve Conley (Bloop); Amanda Conner (Harley Quinn); Katie Cook (Gronk); Darwyn Cooke (Richard Stark's Parker); John Gallagher (Buzzboy); Cully Hamner (Convergence: The Question); Dean Haspiel (The Fox); Jaime Hernandez (Love and Rockets); Klaus Janson (Superman); Dave Johnson (Inhumans: Attilan Rising); JG Jones (Strange Fruit); Denis Kitchen (The Best of Comix Book: When Marvel Went Underground); Barry Kitson (Empire: Uprising); Seth Kushner (Schmuck); Mark Mariano (The Other Side of Hugless Hill); Ron Marz (Convergence: Batman and Robin); Terry Moore (Rachel Rising); Tom Palmer (The Avengers); Jimmy Palmiotti (The Con Job); David Peterson (Mouse Guard); Ron Randall (Convergence: Catwoman); Budd Root (Cavewoman); Don Rosa (Donald Duck); Stan Sakai (Usagi Yojimbo); Matteo Scalera (Black Science); Bart Sears (Bloodshot); Louise Simonson (Convergence: Superman - The Man of Steel); Walter Simonson (Convergence: Superman - The Man of Steel); Andy Smith (Earth 2); Charles Soule (Uncanny Inhumans); Ben Templesmith (Gotham by Midnight); Frank Tieri (Suicide Squad); John Totleben (Swamp Thing); Rick Veitch (Saga of the Swamp Thing); Mark Waid (Daredevil); and Thom Zahler (My Little Pony: Friends Forever). GOLD COUNTRY, Calif. /PRNewswire/ -- Charlie Chaplin and Mack Sennett have been household names for 100 years, but few people know how they got their start in the film industry. Who were the career-makers of the early 1900s in film? They were brave pioneers like author Jillian Ada Kelly's great-grandfather Charles O. Baumann who helped forge a new industry and set the standard for how films are made to this day. "Not only was Charles Baumann a producer, director, distributor, financier, and an executive of filmmaking, he was also a visionary and a man of many firsts in an industry of imitators. He was the first to supply movie houses with posters for advertising in 1909; the first to hire Mack Sennett, the 'King of Comedy,' as a director in 1909; the first to make multiple-reel weekly movies in 1910; the first President, and co-founder, of Universal Film Manufacturing Company (now Universal Studios, the oldest studio in the U.S.) in 1912; the first to hire Charlie Chaplin for a movie role in 1913; the first to bring together top directors Mack Sennett, Thomas H. Ince, and D. W. Griffith, with top actors, including first-time movie actor Douglas Fairbanks, to form the powerhouse Triangle Film Corporation in 1915; and the first to create a money-lending corporation, the Great Northern Finance Corporation, to fund aspiring movie producers to create excellent cinema in 1921. These are just a few, but certainly not all, of the pioneering things that Charles O. Baumann did to help mold and bring greatness to the motion picture industry." Kelly shares her inspiration for writing this book: "My great-grandfather had such a profound impact on the early film industry, I wanted to ensure that he was not forgotten." From BleedingCool: The show is called "Fear The Walking Dead." From Indiewire: Bradley Cooper is now reportedly set to direct that A Star is Born remake that Clint Eastwood abandoned. From Deadline: Those darned Negroes, taking jobs from Caucasian actors! From Vulture: Then, scorn followed that Deadline article. From YahooMovies: Steven Spielberg signs to direct sci-fi novel to film for Warner Bros.
From YahooMovies: Who can get $20 million a film. From YahooMovies: Born in New Zealand, Russell Crowe still can't get Australian citizen, although he has lived in the country since he was four. From THR: The winner of the March 20th to 22nd, 2015 weekend box office is Insurgent with an estimated take of $54 million dollars in its debut weekend. From SoundonSight: Chris Rock is working on to a follow-up to the well-received Top Five (of which I will post a review soon). Producer Scott Rudin wants some of the cast of Top Five back for the new film, which will not be a sequel. From YahooCelebrity: Michelle Rodriguez talks about her grief over the death of her "Fast & Furious" franchise costar. From YahooGames: Ryan Reynolds tweets first image of his Deadpool costume for next year's "Deadpool" film. From Comicvine: Jesse Eisenberg as Lex Luthor - first look. From TheVerge: The Avengers comic book has a new look and a new team. From CinemaBlend: Tyrese Gibson hints that his is the new Green Lantern. From YahooGames: New "Fantastic Four" movie poster is revealed. From CinemaBlend: In the upcoming Ant-Man, Scott Lang may be depicted as a straight-up criminal, something that Marvel had recently played down. From Vulture: The Russo Brothers, the directors of Captain America: Winter Soldier and its sequel, Civil War, will reportedly director the two Avengers: Infinity Wars films. From YahooTV: Jennifer Lawrence says that her stint as Mystique in the X-Men is coming to an end. From CinemaBlend: The movie Spider-Man may indeed by Peter Parker... sadly. From YahooTech: The plot of "Captain America 3?" LONDON--(BUSINESS WIRE)--A new free-to-view TV channel will launch with a bang in millions of UK homes on 15th April, when Spike goes on air offering a mix of British commissions and big-name talent alongside a range of acclaimed drama and entertainment. Original commissions will feature prominently on Spike from launch. Police Interceptors Unleashed marks a return to British TV screens for actor and former professional footballer, Vinnie Jones, who will front the series, following the work of the high-speed police interception unit. Another new series, Tattoo Disasters UK, will seek out some of the most painful examples of British body art and the individuals having to learn to live with their inky mistakes. Spike’s launch line-up will also feature some of the most acclaimed and talked about TV drama of recent times, including Breaking Bad, which will be broadcast from start to finish for the first time on British TV. The latest and fifth series of The Walking Dead will also be available on Spike, the first time it will be accessible free-to-air to British TV viewers. Other acquired dramas that will broadcast on Spike from launch include the British TV premiere of mythological blockbuster, Olympus, Emmy nominated Justified and crime thriller Sons of Anarchy. Lip Sync Battle, hosted by two-time Grammy Award-winner LL COOL J, will be the entertainment flagship of Spike’s launch schedule. The highly-anticipated half-hour original series – based on the cultural phenomenon of lip sync battling seen by millions on television and online – has been created by Jimmy Fallon and his Eight Million Plus Productions, Stephen Merchant (Hello Ladies, Extras, The Ricky Gervais Show), John Krasinski (The Office, Promised Land, It’s Complicated), Matador (Banksy Does New York) and Casey Patterson. Merchant also features on-screen as one of the many A-list musical combatants in the series. Social media comedy phenomenon, Fail Army, has also been reworked for television and will be introduced to UK TV audiences by Spike. The channel will also offer a range of reality series from Spike in the US, including Catch a Contractor and Frankenfood, as well as repeats of some of Channel 5's most popular factual output. The 24-hour network will be available from launch on the majority of the UK’s digital TV platforms, including Sky TV, Freesat and Freeview, on which it will occupy channel slot 31. Spike UK is the latest general entertainment channel from the Channel 5 stable, bringing its portfolio of free-to-air UK networks to nine. The channel will be available from launch on 15th April via the main digital TV platforms in the UK, including Sky TV, Freesat and Freeview on which it will occupy channel slot 31. Spike UK offers a mix of original commissions, smash hit acquired drama and blockbuster films, factual library content and adrenalin-fuelled sports blended with a range of reality series from Spike in the U.S., which is consistently amongst the highest rating basic cable networks. Both Spike in the U.S. and Channel 5 are owned and operated by Viacom International Media Networks, a unit of Viacom (NASDAQ: VIA, VIAB), one of the world’s leading creators of programming and content across all media platforms. Live It Like Spike by accessing www.spiketv.co.uk and following the channel on social media – twitter.com/spiketvuk and www.facebook.com/SpikeTVUK.